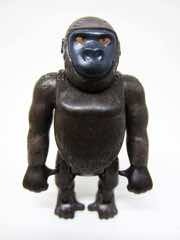 There is a bit of historic significance to Gorillas, if such things interest you. The father of Playmobil is largely Hans Beck, a man who designed the look and feel of much of the line from 1974 until his retirement in the 1990s. 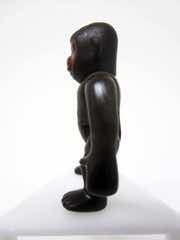 The human figures were developed to mimic a typical child's drawing - no ears, no nose - and many of his animal designs were the same way. They were simple shapes that evoked the form of the creatures, but didn't necessarily perfectly replicate a real horse or lion perfectly - but many of the significant elements were present. Things got more and more detailed as time went on and the peak of the Beck era - indeed, his final piece - was the adult gorilla design you see in this set. 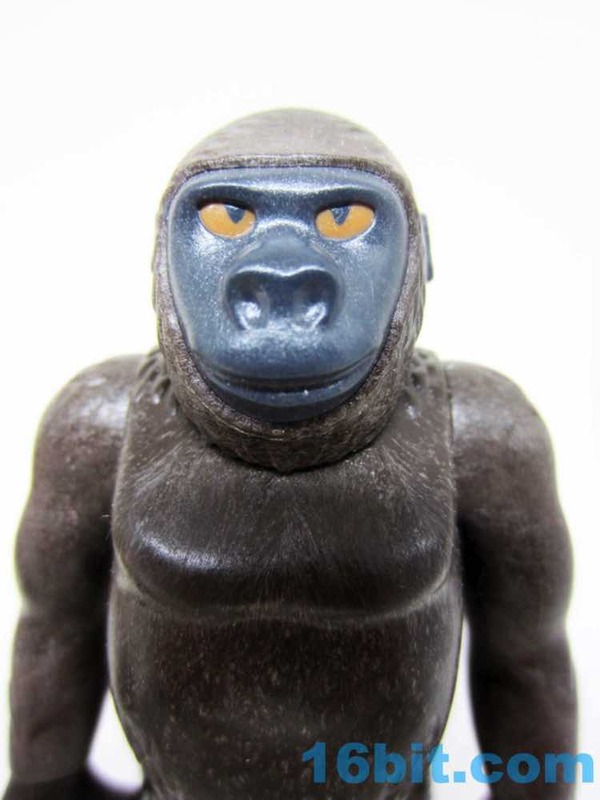 This gorilla mold had been included in many sets for nearly two decades before appearing in this set, and the fact that it's still being sold largely unchanged speaks volumes of the overall quality of the piece. Also getting it right the first time. The bag includes the one adult plus two babies, the latter of which debuted after Mr. Beck left the company. 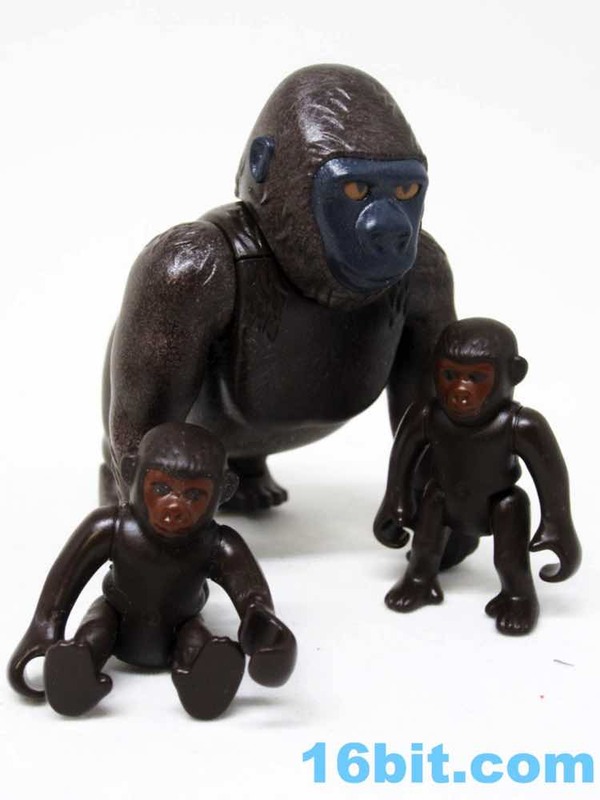 The big gorilla is a pretty sturdy and durable piece of engineering, while the babies are simpler and aren't nearly as awesome. 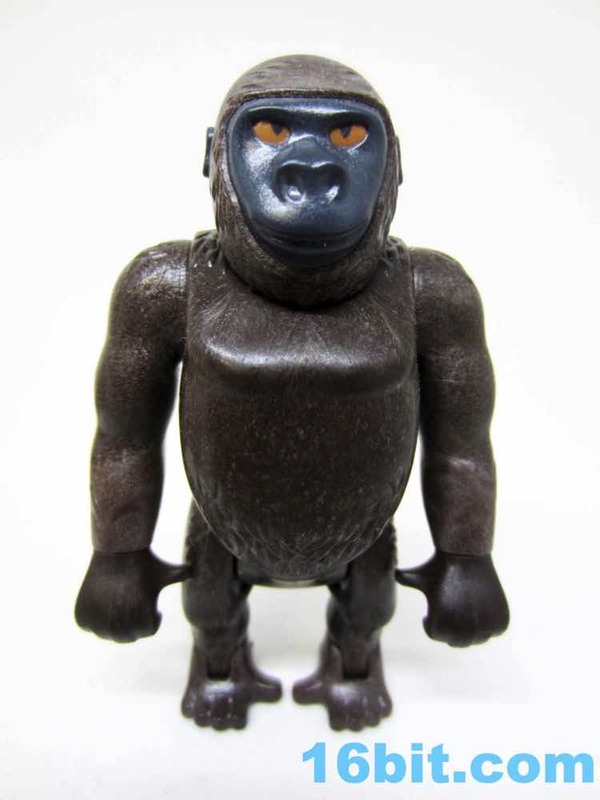 They're good, charming, and well-designed but the big gorilla is just plain superb. The silverback gorilla is a male by default, ad the big primate is actually more articulated than the human figures. 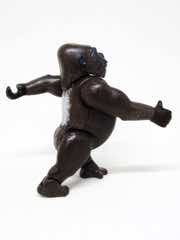 He's capable of a great range of movement with articulated wrists, separately moving legs, jointed ankles, moving shoulders, and a head that can slide up and down - but not swivel. 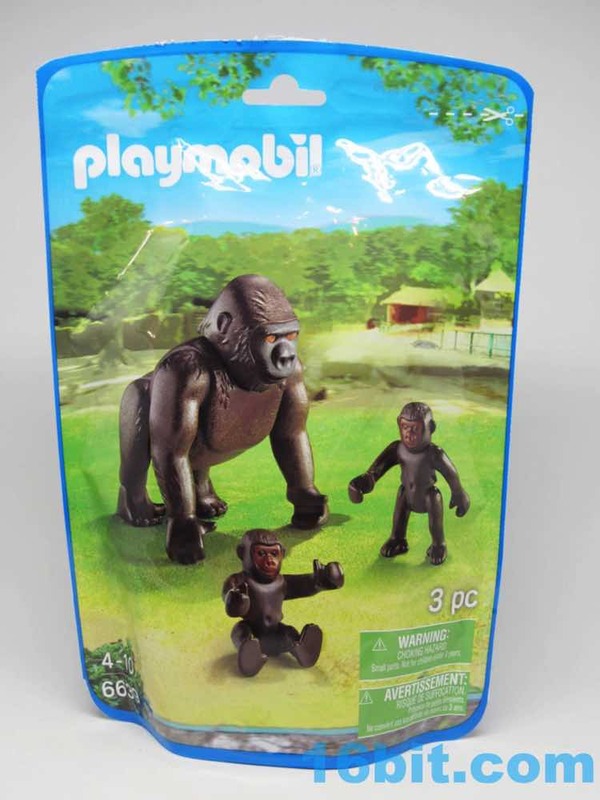 Ankles were rare in Playmobil animals back then, but for the bipedal vs. quadrupedal movement needed for this mighty creature you can't cut corners. 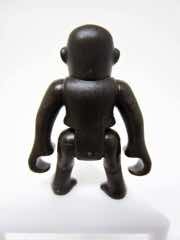 The figure has no problems standing up or walking on all fours, and features bright yellow eyes on a basically hairless grey face. His fur is largely implied, but a few strands are sculpted to give him a faux shaggy look. 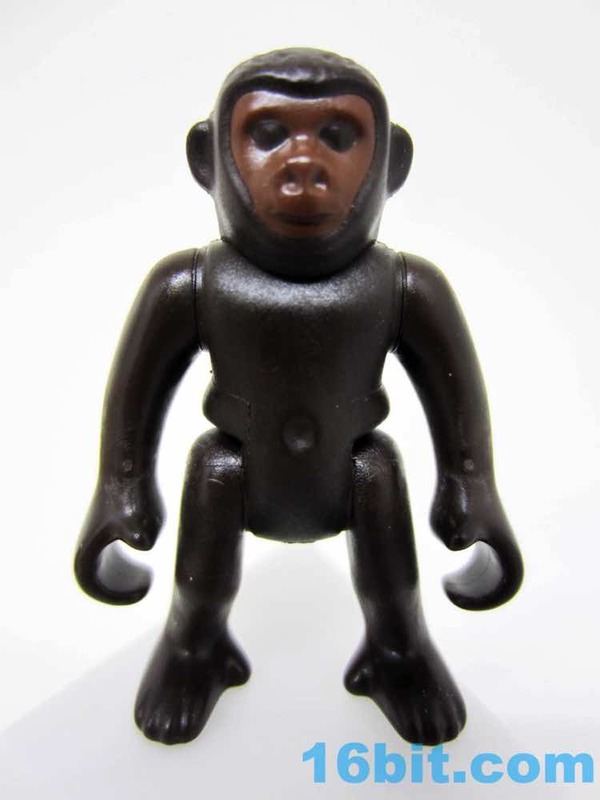 He's a smooth simian, but sports a unique kind of plastic texture that's light, airy, and somehow appears almost furry despite being completely smooth. If you ever see one of these up close, you can see little flecks or fake strands backed right in to the body that further the fur illusion. Playmobil uses this technique on many of its mammals, even the whales. The baby gorilla is cute, and you get two of them. 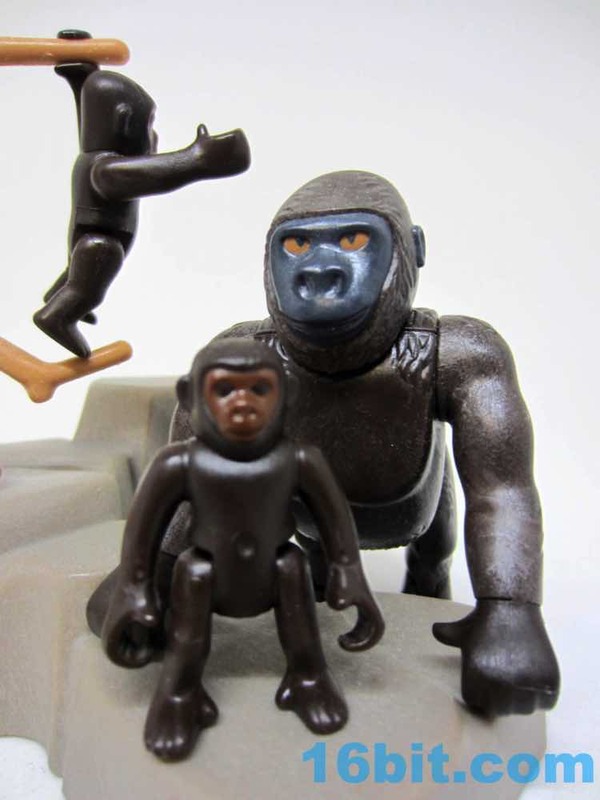 The color of the face doesn't perfectly match their old man, but it looks like an ape with large ears and a hairless mug. Each has a visible belly button and lacks the illusion of fur on their pappy - just a tiny but of fur sculpting is on their heads, while the rest of the body is smooth and a waxy, even brown plastic. 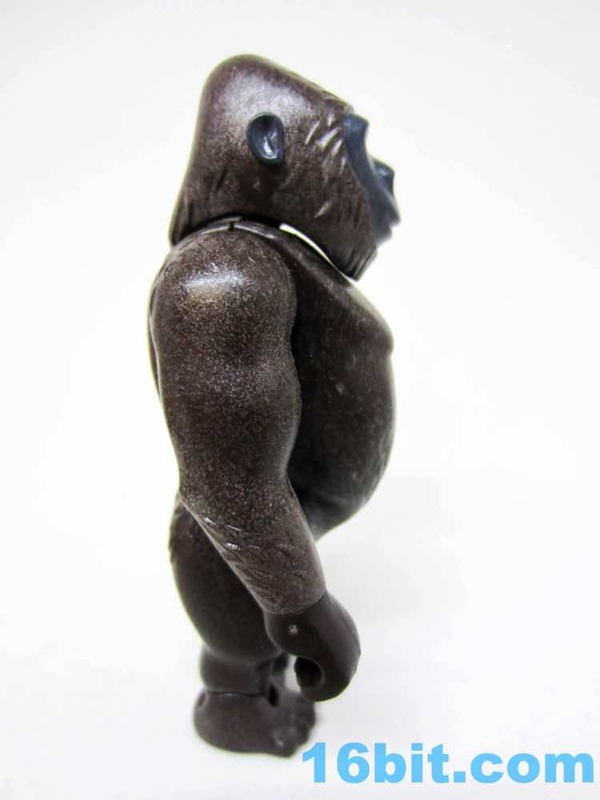 Their arms and legs swivel so they can hang on to trees or other accessories, and a large hole in their bottom allows them to sit on branches without falling off. And not other things. 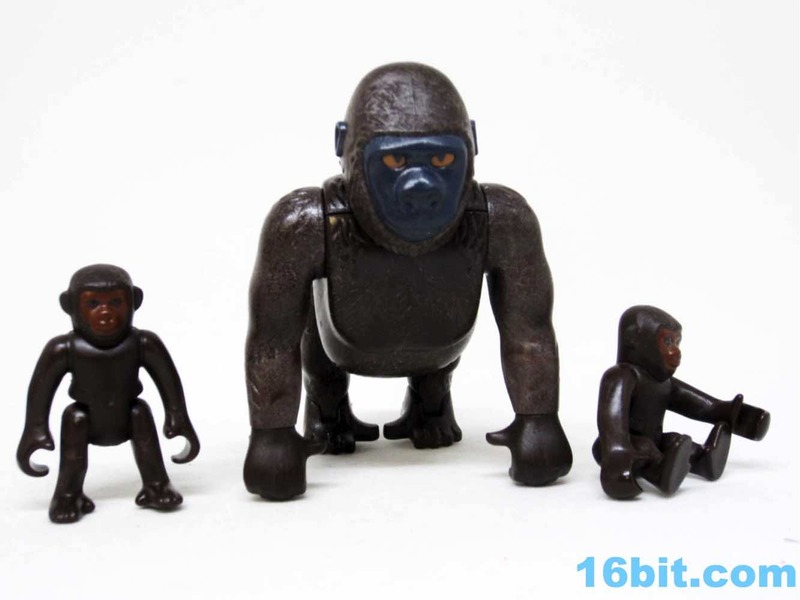 Each baby gorilla is sized about the same as a LEGO minifigure, while dad is slightly taller than a typical adult Playmobil Klicky. The set is worthwhile if you don't own gorillas - plus it shows up on a lot of sales as of late. For under $10 it's a bargain, for more than $10 I'd advise trying to get it in another zoo or wild animal collection. 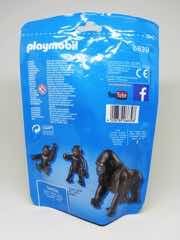 It's a quality figure, but Playmobil's animals tend to have a decent life at retail - so don't feel beholden to the secondary market if this figure is no longer available in your area. The adult male gorilla is easily one of the better creatures to collect in this range. 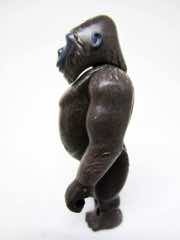 Here's hoping we can get a lady gorilla later. Maybe one that has a kitten, and knows sign language.